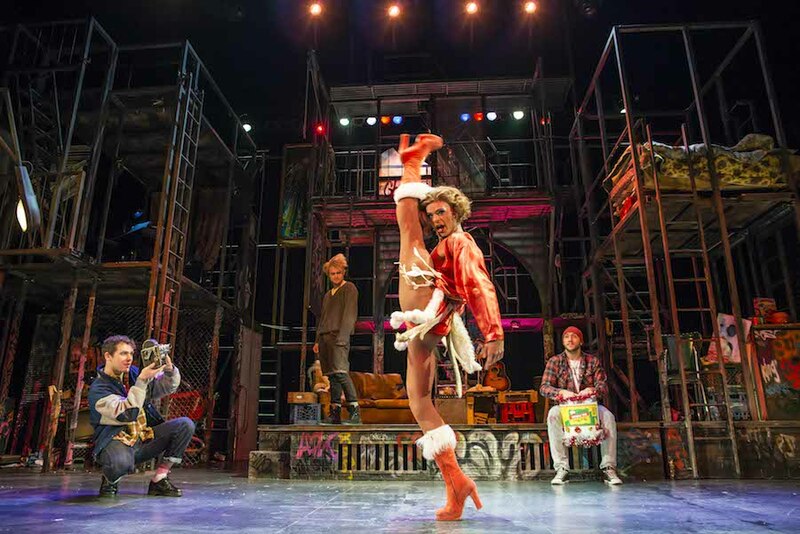 Review: Rent. Nottingham Playhouse. – East Midlands Theatre. 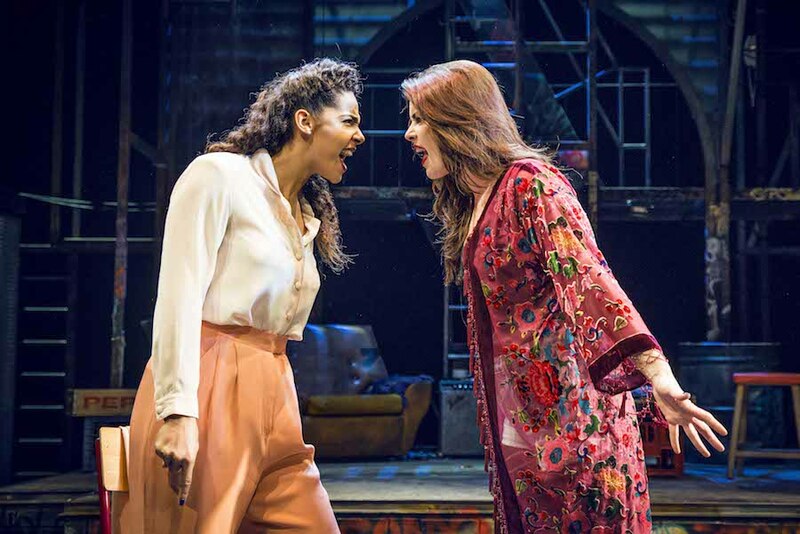 This new production celebrating the 20th Anniversary of Rent – the musical – book, music and lyrics by the late Johnathan Larson is totally worthy of the rapturous applause offered by the Nottingham Playhouse audience. The show runs until Saturday 20th May at Nottingham Playhouse. The show is touring after a ‘blisteringly successful’ run at the St James Theatre in London. Bruce Guthrie directs this brand new production of the multi award winning rock musical finely balancing some sterling acting, emotionally tender lyrics and music and some great rock numbers. On its first night at Nottingham Playhouse the production encounters some technical issues in the sound department at the outset and late into the second half where the show has a brief hiatus. Regrettably some momentum is lost in the drama but the performers pick up again and the show and its energetic performers receive a standing ovation. 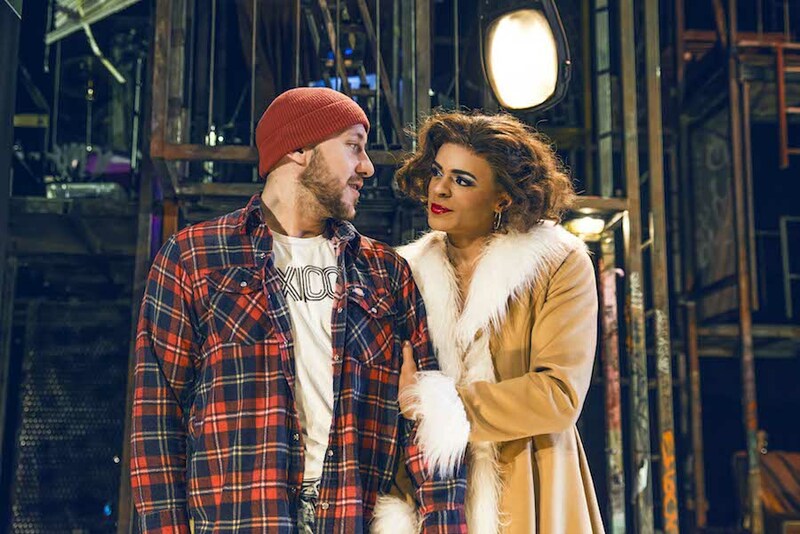 Rent is often hailed as a landmark musical telling the stories of a group of impoverished young artists struggling to survive in New York’s East Village in the mid 1990s – a time of bohemian excess, and sexual liberality sheltering and suffering under the ever darkening skies of the AIDS epidemic and HIV. 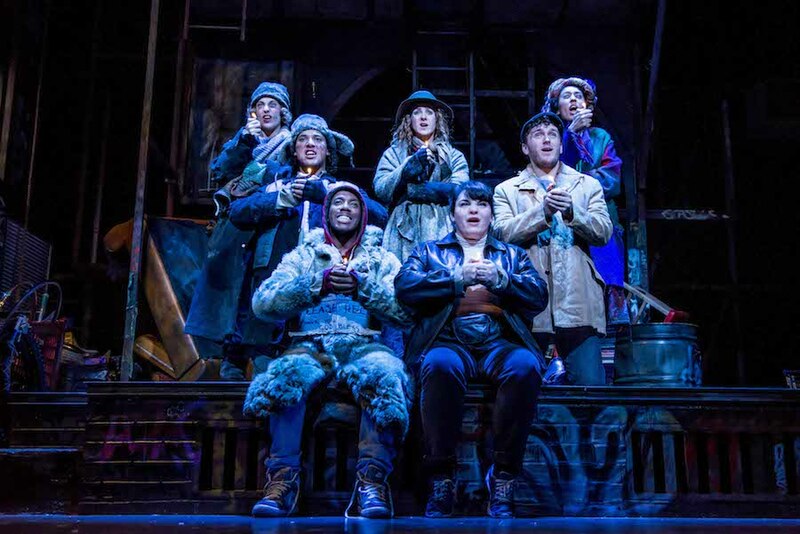 The story is well known to be inspired by Puccini’s classic opera La Bohème and features unforgettable songs by Larson such as Seasons of Love, Take Me Or Leave Me, Light My Candle, and La Vie Bohème. Since its Off -Broadway opening on 25th Jan 1996 the show originally ran on for an amazing twelve years bringing to the New York theatre scene a musical that appealed to the young and less affluent theatre goer. Their stories writ large on stage. 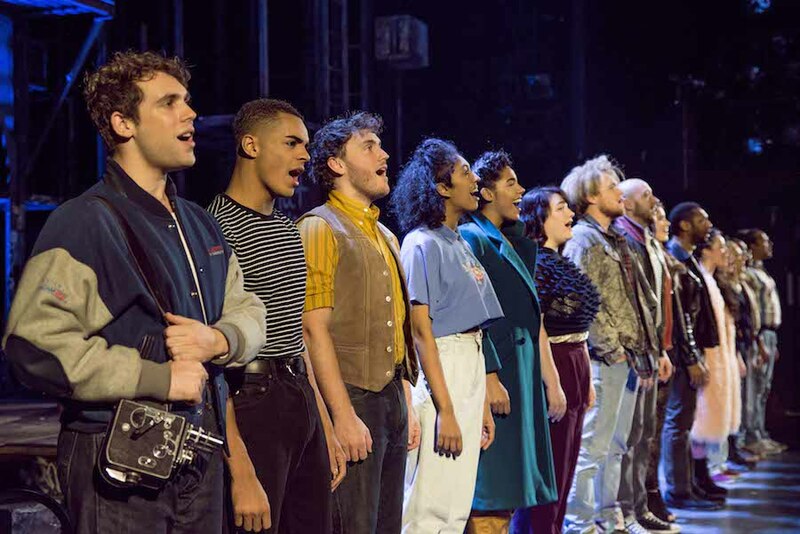 In this production the entire cast put their very hearts and souls into the musical which is appreciated by a capacity audience including a large group of youngsters. 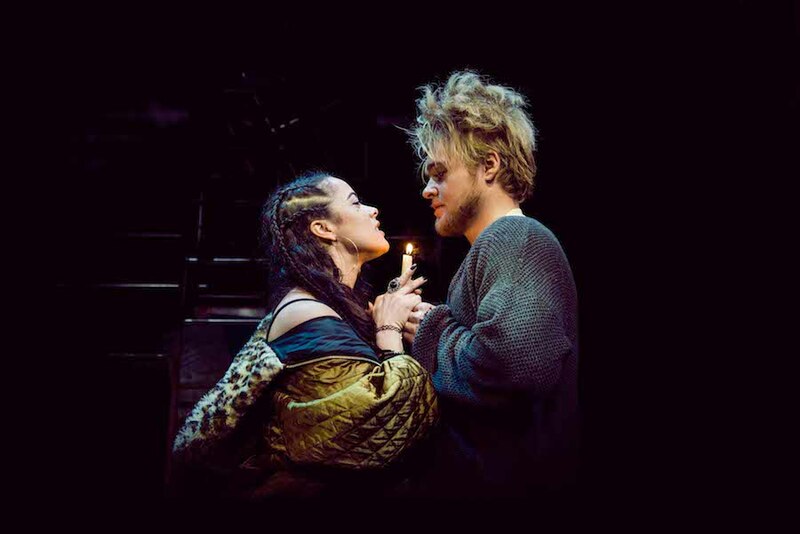 Ross Hunter stands out emotionally and vocally as HIV positive Roger Davis and his pairing with Philippa Stefani as Mimi is totally believable. Lucie Jones shines in the second half as Maureen Johnson and is both funny and credible as her lesbian character in and out of love with Shanay Holmes as Joanne Jefferson. Billy Cullum as indi film maker Mark Cohen is very convincing as the human glue that tries to keep the boho family together. As the central gay couple Ryan O’Gorman (Tom Collins) and Layton Williams (Angel Schunard) are wonderfully cast showing their utter love and dependency on each other until the bitter end. Williams singing and dancing are superb. Each song gets great audience approval from this Nottingham Playhouse audience and Lee Proud’s choreography is at times electric. 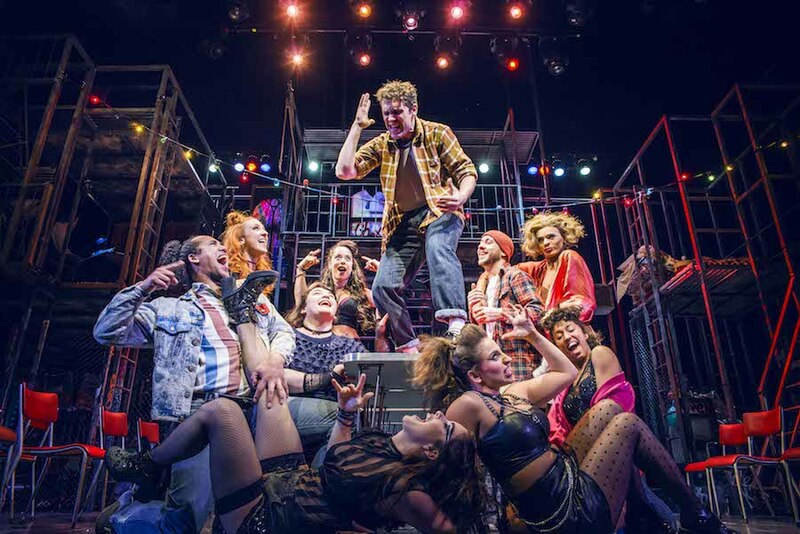 The set is a complex maze of scaffolding mixed in with neon signage denoting a raw 1990s New York. Rent refers to the rent not being paid by the down at heel artistic inhabitants but it could also refer to lives being rent apart by difficult circumstances and choices in matters of the heart. What shines out most however is a bold celebration of love that survives even in the cruellest of decades where thousands were dying of AIDS and HIV related disease. Rent celebrates life however briefly the candle of hope is lit amongst its characters. I also really enjoyed this show when I saw it in Coventry! The current cast is absolutely incredible and I loved the set and choreography!! I only wish I could see it again with the same cast before it finishes but I don’t think I’ll manage! I saw Rent last year when it toured to Charlotte. When I found out it was coming to Charlotte in 2016, I knew I had the amazing opportunity to finally see Rent live. 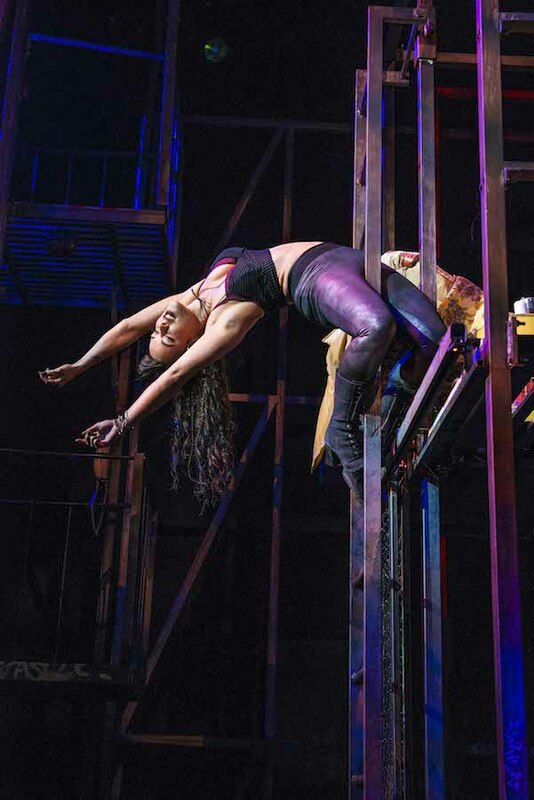 I loved Rent since Fall 2012 and have been waiting and waiting to see it live, but never seemed to tour the US, which is why I was happy it was touring to Charlotte. It was a Christmas Present and I was an emotional wreck watching it and was worth that 5 year wait.